Sapporo 5th Anniversary Rilakkuma Plush! Dreaming of snow and winter as summer gets closer? Cool down by hanging out with one of my newest additions: Bobsled Rilakkuma Plush from the Sapporo 5th Anniversary Series! Protective helmet to keep him safe and warm, with bear emblem in the front and center. The bobsled itself has a bear profile, with subtle red “ears” attached to the sides, with a large yellow bear design in the front. Profile shows two white racing stripes and a sporty yellow Rilakkuma title. I love the little bear for the dot on the “i”! This Rilakkuma is completely removable from his bobsled (no strings attached!) so other bears can have some winter fun, too! I think the tag art is uniquely beautiful, with a pretty snowflake design with little bears at the spikes. Nice peek of the fabric tag with gold foil embroidery describing the anniversary location and year, a motif of all anniversary designs from this cycle (compare to the satin ribbons from last cycle). This sporty bobsled Rilakkuma was released as part of the Sapporo Rilakkuma Store’s 5th Anniversary celebration held November 2016! This is the first Rilakkuma plush to ring in the current cycle of sports-themed anniversary bears! Last cycle was the Rilakkuma World Tour, featuring Rilakkuma and friends traveling across the world. This cycle, the designs all represent important sports in Japan! Also, I’m glad they brought back the full-sized bears for this cycle—just as I was starting to get used to the mini-bears from the past two haha. This Rilakkuma design is especially meaningful because the country of Japan made their official bobsled/bobsleigh debut at the 1972 Winter Olympics, with the bobsled event being held in Sapporo! Furthermore, according to the announcement for this anniversary event on the Rilakkuma blog, this design is supposed to represent all winter sports, including bobsledding, skiing, and snowboarding. I love how thoughtful these Rilakkuma designs at representing significant slices of Japanese culture and history! Big thanks to my Aunt Lulu for chaperoning him all the way here from the Philippines! We are so grateful for his immigration! So happy that Bear Country is branching out to athletics! I’m also excited to have even more sports bears from this cycle to share with you! In more relatable Rilakkuma news, this new design featuring sleeping Rilakkuma saying “Please don’t wake me up, I want to sleep more…” will be popping up in June! Tote bag: 2,480円. Passcase: 1,600円. This line will be released in Rilakkuma Stores across Japan on June 3, and includes bags, passcases, pouches, and even a commemorative fork! Such a big difference in attitude compared the sporty bears from the Anniversary line, huh? I think even Rilakkuma athletes want to sleep in some days. What kind of sports do you want to see Rilakkuma play? Or are you more of a ~sleeping in~ Rilakkuma type? Goodies from the Rilakkuma Booth at Anime Expo 2016! Woooo! Check out this swag from the Anime Expo 2016 Rilakkuma booth! 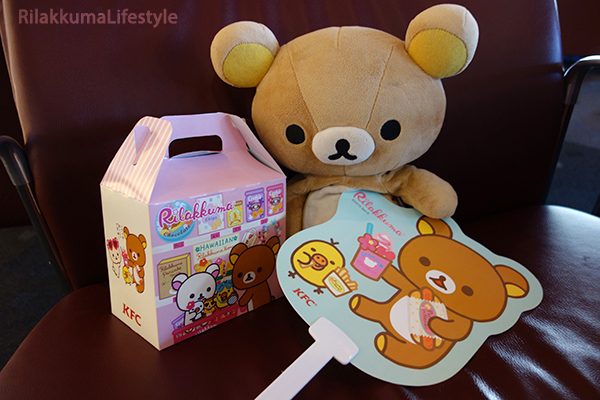 Collectible Rilakkuma bag, fan, sticker, brochure, and deco tape – wow!!! Haha so I didn’t actually go to Anime Expo this year but! Rilakkuma.crossing did, and she picked up a ton of Rilakkuma stuff for me from their booth – so huuuuuuuge THANK YOU!!! (And check out her Rilakkuma-filled instagram!) I appreciate the opportunity to live the Anime Expo this year vicariously through her haha. As someone who buys most of their Rilakkuma online, Rilakkuma events like these are always something I wanted to go to! 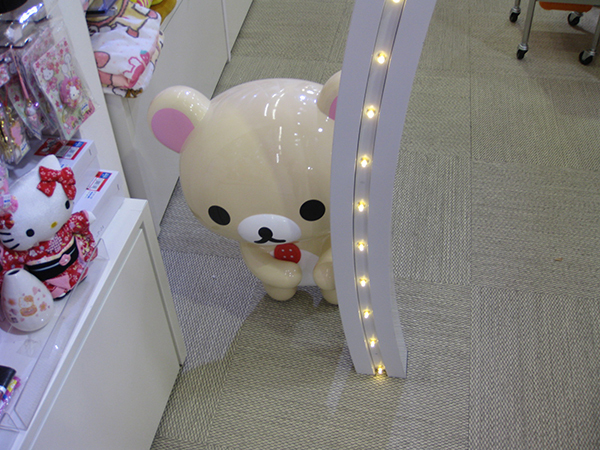 I love meeting other Rilakkuma fans and actually seeing Rilakkuma stuff in person haha – maybe one year I’ll get to go! I love the stuff they gave out this year because look! There’s Koguma-chan! Haha the introduction of Koguma-chan (Korilakkuma’s New Friend Series) has been a huge highlight for me this year, so I love that he is so prominent in their merchandising here in the US now too! Rilakkuma.crossing also picked up a black tank top for me from the newest Japan LA x Rilakkuma clothing line! Dressing up for a night out with black leggings and heels! And finally I get a chance to pair an outfit with my new pancake stack necklace from Oh Lucky Charm! Clothes have tag art too! I love it! Super soft material that matches will lots of other items – easy to dress up or dress down! I feel so confident wearing this, and I can’t wait to see what Japan LA cooks up for their Rilakkuma clothing line next!! You can pick up this top and their other collaboration pieces over at Japan LA’s online store! Elsewhere in the Kuma-verse: have you spotted the A’PIEU x Rilakkuma collaboration? APIEU is a Korean cosmetics brand, and their Rilakkuma collaboration line includes foundation, bronzer, blush, cleanser, and eye products is out now – wow! I definitely don’t need any more beauty products, but I have to admit, I’m a huge sucker for cute product packaging and marketing. Speaking of egregiously cute, the newest addition to the summer Teahouse Series is this San-X Net Shop Exclusive plush! Big dango cushion! Korilakkuma even has her signature button! 10,800円 on pre-order. There’s even a spot to rest your head next to team Rilakkuma! Okay, well isn’t this just adorable? Seems about time for a dango-heavy theme to feature the Rilakkuma team faces in each of the dango pieces haha. I think this is a really creative and appropriate design, and just perfectly big and bombastic as I have come to expect from Net Shop exclusives. Pre-order is now open at the San-X Net Shop, with expected delivery in early October. Finally, the Rilakkuma World Tour is wrapping up with its final locations, and as such is wrapping up with a final bus playset! How worldly! 13,800円 available on August 6th. This big yellow bus features the themed Rilakkumas from London, Mexico, Africa, Austria, Hawaii, and France – and their tour guide in pink is who I’m guessing is the big boss representing all of the Rilakkuma stores celebrating their anniversaries! That’s all for now! Any new Rilakkuma additions in your horizon, or did you get to go to the Anime Expo this year? I just started my internal medicine rotation this week and it’s been so great so far. I also finished all of my exams for the year, so right now, I just have to focus on learning and getting ready for residency next year – feels amazing! I was originally planning on doing individual plushie posts later, but I couldn’t wait to share this one! The top cracker he’s holding up says 鹿せん (shika-sen), which is the cracker used to feed deer; the bottom cracker 奈良 (Nara), the region he represents! This plushie was produced by HNA with a Rilakkuma license! 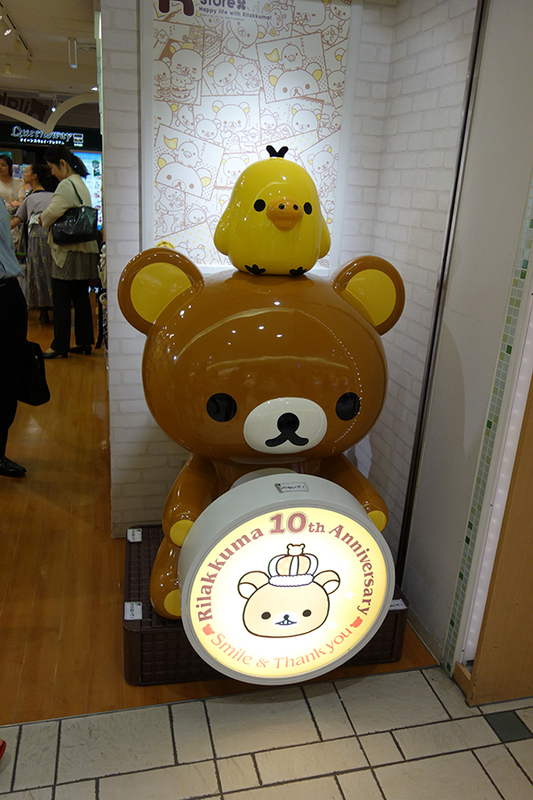 Basically, each prefecture in Japan has its own special Rilakkuma based on the what’s special for that particular city. In Nara, there are a TON of deer, so Nara Rilakkuma is appropriately wearing deer antlers and holding up a rice cracker called shika-senbei – you can buy them to feed the deer. 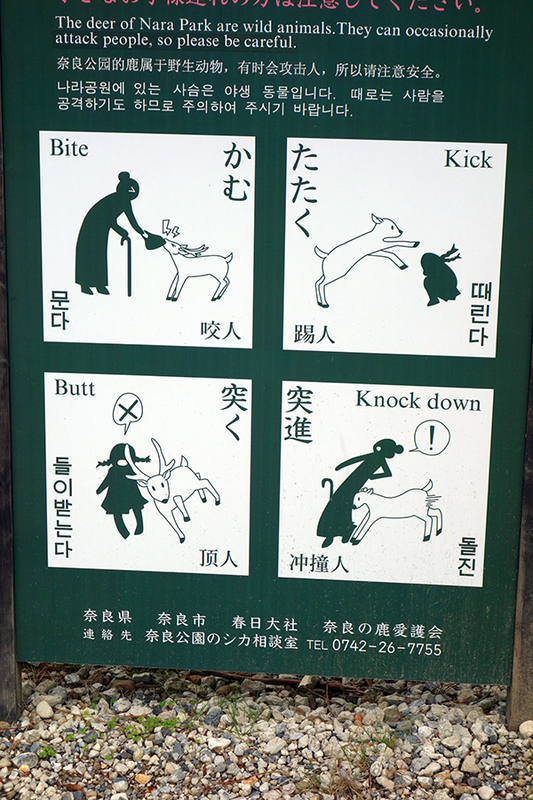 I think it’s really fitting because it seems like deer paradise in Nara. 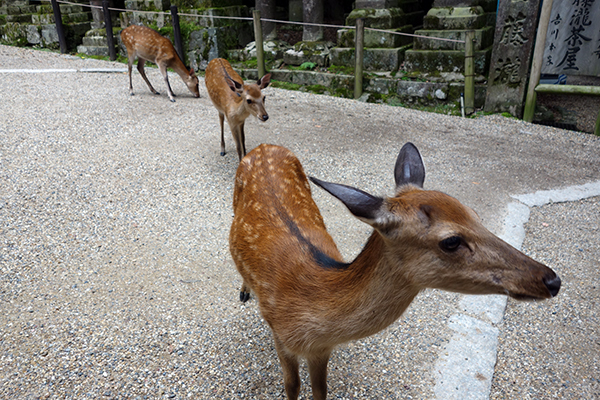 According to legend, one of the gods (Takenomikazuchi-no-mikoto) appeared on a mountain riding a deer, and since then, deer have been considered messengers of the gods in Shinto! Back then, killing a deer was a crime punishable by death! One photo really does not do them justice – there are really deer everywhere! In any case, I was super excited to run across this Rilakkuma plushie! Wish I could’ve found more – the HNA website lists 59 different Rilakkuma designs in just the Kansai region alone! They seem pretty difficult to find though; we only ran into this one at a small souvenir shop by chance as we were leaving Tōdai-ji. 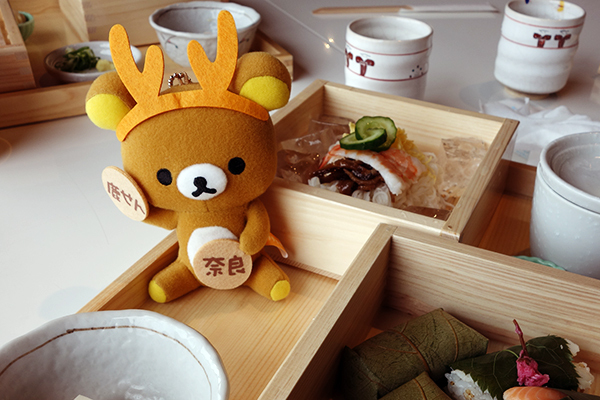 Speaking of deer… I hear that the newest Rilakkuma series leak is a deer Rilakkuma?? Thanks for the tip, Kumadokidoki and Mary! 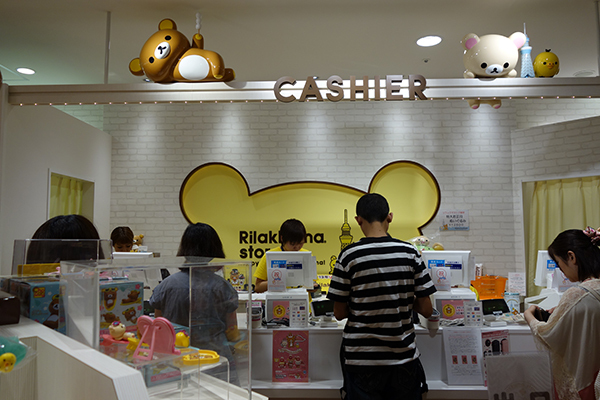 The Tale of Four Rilakkuma Stores! Hello! I’m more than halfway through my Japan trip and I finally have time to sit and blog for a bit about what’s happened so far! Thank you everyone for your well wishes – we arrived safe and sound at Tokyo! Anyway, for the first two nights, we were in Tokyo, just minutes away from Tokyo Station! We were kind of in a hurry to get to dinner rather late at night, so we didn’t get to shop but! we did get to check out the Tokyo Station Rilakkuma Store! 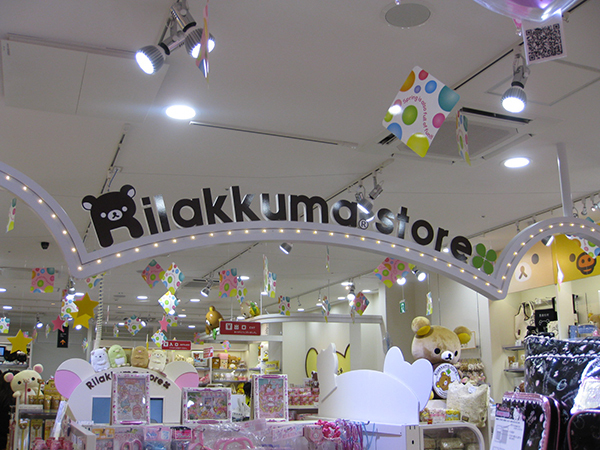 Ariel already made a post on this store recently, but it’s really quite incredible to see a Rilakkuma Store in person! Will shop here for real soon! We’re going back to the Tokyo Station area for a day before we leave Japan, so I will be sure to shop there for real next time! The next day, we went to the Tokyo Skytree Rilakkuma Store! I got one of those Skytree plushies with all three of the Rilakkuma crew! Paying the Rilakkuma Store workers’ salaries in one fell swoop. This was the first time we got to spend a great deal of time at the Rilakkuma Store. They had a bunch of Skytree specials (though the Tokyo Station one also sold a few Skytree plushies), and I feel like I circled the store over 20 times analyzing everything before paying and leaving. The small 22cm watermelon anniversary plushies were sold out, but there was no shortage of the XL version – I wonder why? Whew! Then the next day, we ran over to the Harajuku Rilakkuma Store! It’s the Rilakkuma half of the floor! 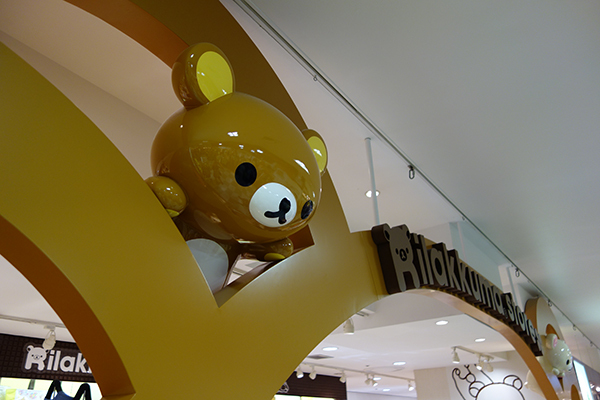 I love how the entrances to each Rilakkuma store is slightly different. Look who’s hiding on the side!! They’re gearing up for their anniversary on the 29th – so sad I’ll miss it!! Finally, on our way out of Osaka, we stopped by the Umeda Rilakkuma Store! Even more plushies to be bought here! I didn’t even know what the Holiday collab was, or what Holiday even is but I snagged one anyway since I was already there. Turns out it’s some clothing brand haha, so cute!! I was really shocked to see that they had some of the Fukuoka 3rd Anniversary plushies there (I wasn’t even in Fukuoka!) – guess they had a few left over? I always assumed the anniversary plushies flew off the shelves like hotcakes. There was also a healthy stock of Rilakkuma apparel that the other branches I visited didn’t have, so my family stocked up on some Rilakkuma shorts haha. Whew! 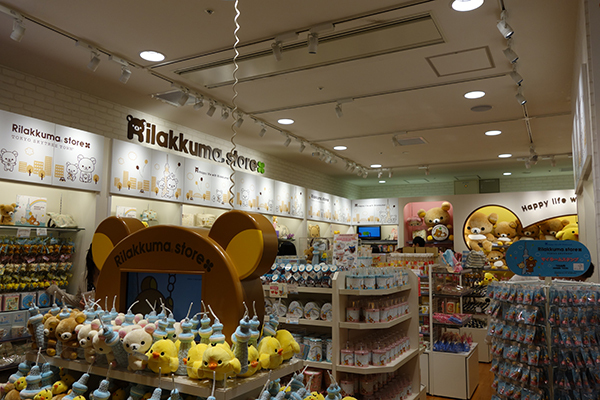 That’s 4 out of 8 Rilakkuma Stores! I know during the next trip, I’ll have to stop by the Fukuoka, Sapporo, Sendai, and Kichijoji branches!! I’ll have to write more when I finally get the time to photograph each of them, but that’s all for now!! All’s quiet on the Rilakkuma front until the Wonderland release, I’m guessing! Quick post: I’m leaving for Japan in 15 minutes! I might be updating with photos if I can, but I’m officially on hiatus! I don’t know how much time I’ll be able to spend online (plus I’m only bringing a tablet). Well, this was taken at the Duke Gardens in Durham, NC, not in Japan… but this bridge was constructed as a partnership with Durham’s sister city in Japan! Also! I just got email confirmation from Lawson that my Rilakkuma x Lawson Aloha Rilakkuma plushie has shipped! Yay! See you all again in 3 weeks! Finalizing my trip to Japan! So my parents have finalized our hotels and tours and everything for our first real visit to Japan! We’ve been in Japanese airports so many times for connecting flights, but have never actually seen the country – I’m so excited! After that, it’s family time in the Philippines for a few more weeks! Fun for me, but not too much Rilakkuma related news on that front haha. SAD NEWS THOUGH: this schedule means I will just barely miss the release of Harajuku 1st Anniversary and Comics Series plushies that come out on the 29th! Noooo! I want a matching hoodie! 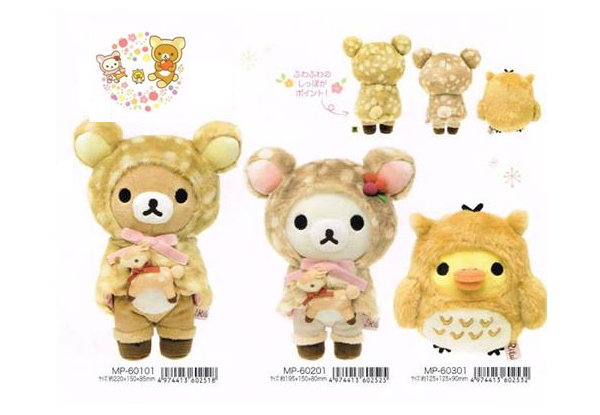 I’m pre-ordering them though, so I’ll get them eventually, but I won’t get to experience the Rilakkuma release day madness in person – which could be a blessing haha, but I’d like to experience it one time just to know what my sellers have to go through for me haha. BUT GREAT NEWS: my sister earned an Aloha Rilakkuma plate from Lawson! As I mentioned before, my sister was participating in a Rilakkuma x Lawson campaign where you could collect stickers from purchases and redeem them for prizes – the campaign recently ended on the 3rd. Though she was originally aiming for the bag (20 stickers), with the help of her classmates, she was able to collect 30 for the plate in less than 2 weeks! WOW! Thanks a bunch to Liemzie and Ariel for helping me and my sister decode this campaign haha! You can read more details and see more photos of my sister’s win at her blog here! Yay!